Well in my previous article i simply mentioned Top 10 Best Android Blogging Apps that Everyone Must Have so today I would like to tell you my favorite iPhone/iPad applications that makes Blogging so easy in 2014. iPhone as you all knows is a line of smartphones designed and marketed by Apple Inc. There are over 500,000 iPhone apps exists in this world so its being very difficult for us to choose the best one. There’s a fact that you cant sit always in front of your Lapy or PC for blogging hence so must need some smart applications for your portable devices such as iPhones,Mobiles,Tablet etc. Anyways have a look at my Top 5 iPhone/iPad apps just below. My favorite app ever, I cant live without it! 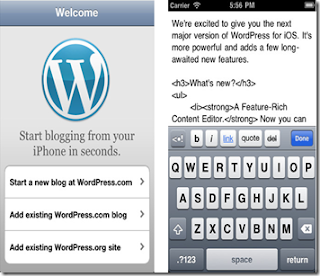 The WordPress app for iPhone gives you everything you need to make a quick post, edit previous posts, make drafts, edit pages, reply to comments, add images/videos, provide links etc. Now you can take your blog in your pocket wherever you want through this app. This app is designed for both iPhone and iPad and comes with its latest version 3.1. Evernote is a great application for taking and saving notes, pics, comments, etc. Its one and the only tool to organize your digital life. This app lets you take notes, capture photos, create to-do lists, record voice reminders–and makes these notes completely searchable, whether you are at home, at work, or on the go. Also It’s an multi-platform cloud based app, so you can easily sync up with any other devices running Evernote like Android devices, Windows, etc. It comes with its latest version 4.2.2. 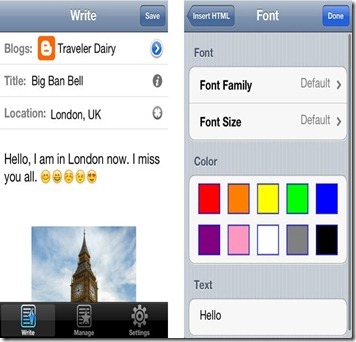 It is an blogging app for both iPhone/iPod Touch and iPad and it is highly integrated with your favourite social networks like Facebook, Twitter, YouTube, Flickr and Picasa! Also It helps you to manage several blogs hosted on several blogging platforms such as Blogger, WordPress, TypePad, LiveJournal, Drupal, Joomla and others. The app lets you do most of the things that you will normally do while log-in to your blog using your computer. One thing that you will most likely appreciate from this app is that you can cross-publish a post to different blogs on different platforms. Now it comes with its latest version 3.0.5. Note- PayPal as everybody knows an part eBay company used to send and receive money from all over the world. This app is very essential for every blogger. Around 75% of the Bloggers use PayPal for making their online payments. 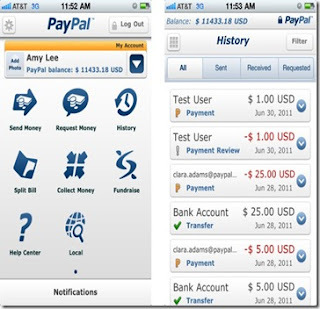 With this app, you can check, send and receive money. I’ve used this app many times before, and it’s secure, fast, and reliable always. It comes with its latest version 4.1. Google Analytics is the leading website statistics and analytics provider ever. Once you start using Google Analytics it’s easy to get addicted. If you already are, then you’ll certainly want to install the official Google Analytics iPhone app. 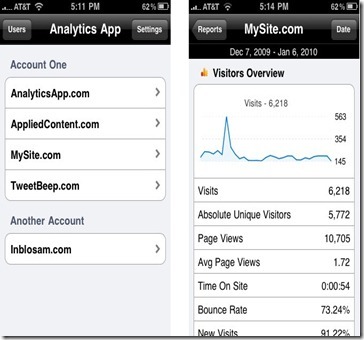 Keep Note- You must have or create a Google Analytics account (free) to use this app! A Google Adwords account will only work if Analytics is activated also. This app lets you to check your website stats, unique visitors, pageviews, clicks made etc. This app comes with its latest version 1.86 and of 3.00 MB in size. 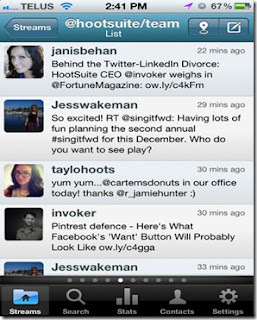 This app HootSuite has the power to manage all your Twitter, Facebook, LinkedIn, and Foursquare accounts in one app. Now HootSuite allows you to send and schedule updates, track click stats, and set up tracking columns to monitor keywords, #hashtags, and lists. With this app, you can also make friends and spread messages to popular social media sites listed above. This app comes with its latest version 2.4.7 and of 16 MB in size. Thats it! Enjoy the Apps.. I am a great fan of apps and that is why I talk about it all the time. I agree with you these are the best and top 5 app for iPhone. 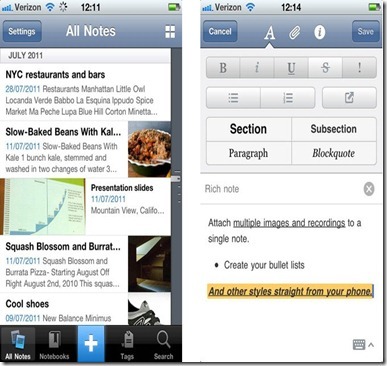 Top 5 iPhone/iPad Apps that Makes Blogging Easy such a so nice tips, thanks for write a good post. Next Post: Negative SEO- Techniques,Tactics and How to Protect yourself?